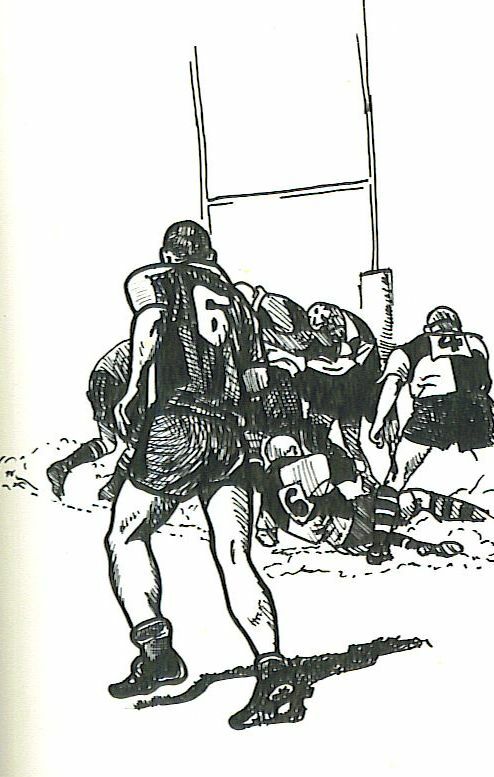 The game of rugby, named after the English prep school where it originated, is normally played with two teams of 15 players, competing in a game lasting for two 40 minute halves. I love that game. The heaviest, and roundest, 7s squad ever assembled. Rugby “7s” is played on the same sized field as regular rugby (called rugby “union” by those who consider themselves official), but features two teams of seven competing for two seven minute halves. Rugby 7s is now an Olympic sport. This weekend NBC will broadcast live the Collegiate Rugby Championship 7s Tournament. It is the events second year and my Alma Mater are defending champions. Last year the games were not hosted by my adopted hometown, this year they are. I am happy to have a hand in said hosting. If one is so inclined, and I would hope you are, one might tune into your local NBC affiliate this weekend and watch a few games. Not only will you enjoy an exciting game and true athletes on display, but you might catch a bit of Brohammas. No really, you might see me. Not my house, I was not host… but wait. 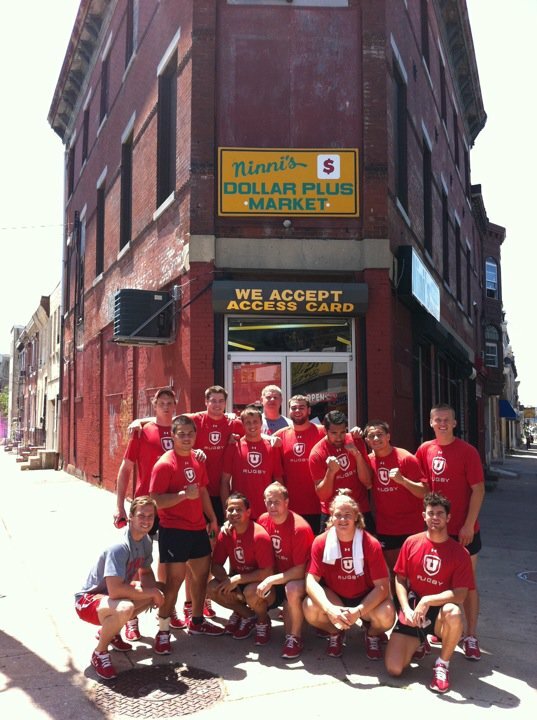 The school gave me a degree, so I returned the favor by giving the Utes my tour of Philadelphia. We boxed around in a boxing gym, saw Rocky’s house, even ran through the Italian Market, then finished by running up the art museum steps. A grand time was had by all. In setting this up, I was hopeful they would enjoy it. Then as I thought longer I knew they would like it. In fact I thought everyone would like it, so I made a phone call. Our recruited host and his camera man leading the team on the tour. The man in the sunglasses, the man whose house we ate at, and watched TV at, was former NFL all-pro punt returner, former BYU standout, Philadelphia sports anchor Vai Sikahema. It was a pleasure spending time with the team, good guys every one, it was great showing of the town, but it was best to see that pride of the Cougar nation wearing red! This was the forced fun portion of the conference. Two hundred twenty something’s, one year into their first post college job, and there was an open bar. There was one other young man not drinking so I approached him. “So where did you go to school?” I asked. That is how we all started our conversations at these things. His eyebrow cocked. We had established each other’s reason for not drinking without having to ask directly, but my newfound brother had a distant look that insinuated there was something more. This UVSC alumnus was about six feet two, blonde haired, and had a movie star jaw. He was the one in the company we all admired, not for his look, but for his territory; he covered Hawaii. Upon establishing that we had in fact been collegiate competitors against each other, and shared a common historic event, he shared more. I had never heard this little bit of the story before. I had never heard it told from the other team’s perspective at all. By now some others had gathered round and more explaining was in order. We, Utah State University, were the hosts. This was to be a “friendly”, meaning the result would not be official, it was a practice game of sorts. Our coach grew up on the island of Tonga, had come to the States for an education, and then just stayed. He did not get paid to teach us the game, nor was he being paid to be the reff that day. Our team, a rag-tag of frat boys, islanders, and general knuckleheads would win the games we were supposed to, lose the ones predicted, and accepted any request for a game extended. This Saturday’s contest came with no crowds, no police, and no ambulance. In this respect it was the same as all our other games. That soon changed. Cia (Siy-uh), had just employed a common tactic of enforcing the rules of play by “raking”. 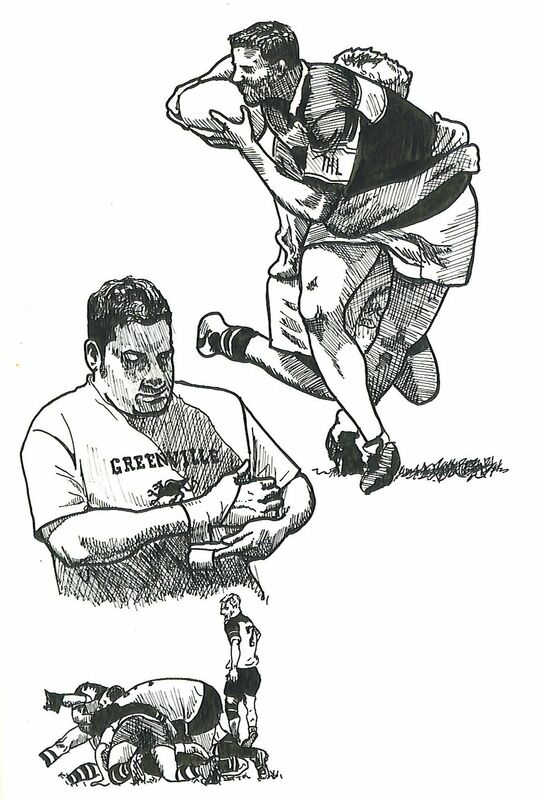 In rugby it is illegal to hold on to the ball once you are tackled and it is additionally rude to lie on top of the ball while it is on the ground. Raking is using your metal cleated boots to encourage the opponent lying on the ball to stop doing so. Most reffs will allow this as long as you don’t rake one’s head, and offenders quickly learn to stop cheating. In this instance the rakee did not learn but got upset. He jumped to his feet, yelled choice words, and started for Cia. Wayne, a slender fellow with two gold teeth who spoke little English came quickly to Cia’s defense with a hard thrown right fist. Nev, the reff, caught Wayne’s fist mid-air, placed his other hand on the other players chest, and prevented a tragedy. This other player, this neophyte philistine, forgot himself for a regrettable moment, and punched Nev in the face. We were not unaccustomed to a scuffle here and there and most just sort of sorted themselves out. Someone would get thrown out of the game and we would finish a man down, or a couple of us would spend 5 minutes in the “sin bin” to cool down and then get cleaned up before the post game party. No big deal; till now. No one had ever punched Nev before and in so doing this unaware hot head had dropped a bomb. Fists flew and lips bled. I saw some of the best tackles a rugby pitch has ever seen and kicking that Beckham could never match. Everywhere you looked there was action, two on one here, one on one there; piles of bodies writhing and biting. Seeing a haymaker headed for a teammates head, I put my shoulder in that guys ribs and dropped him to the ground. Holding his face in the grass I was perfectly posed to be grabbed from behind in a headlock and pulled backwards. Flat on my back I had a great view of the player above me, kicking me in the chest. I also had a great view of Wayne executing a beautiful flying kick that crumpled my tormentor like a paper doll. Usually when things like this begin, some sort of authority steps in and brings it to a close. I began to wonder how long this was going to continue as I bear hugged a very angry, but smaller, player from the other team. I held him immobile off to one side for what seemed like an eternity before I saw the other team sort of trickle off the pitch, gather their gear, and leave. I released my prey to join them and flopped onto the grass exhausted. As I lay there Nev walked past and said, “Guess we are done for today.” The incident had lasted more than twenty minutes. 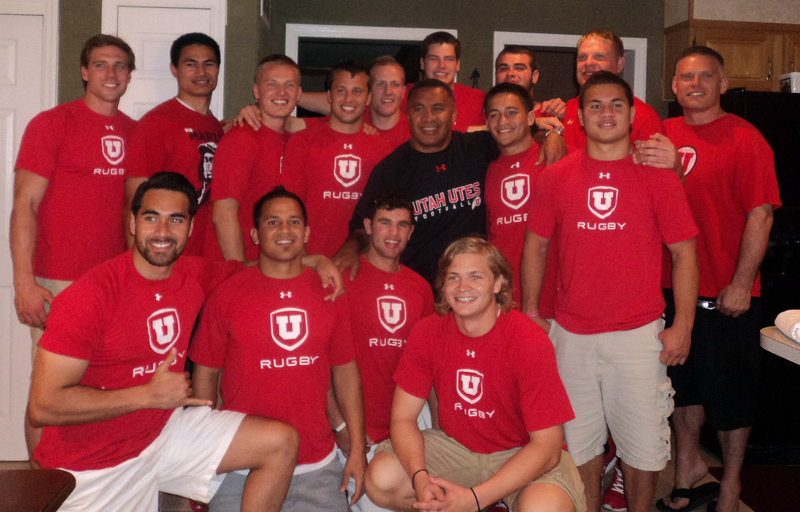 I sat round the kava bowl with my roommate and some other players later that night. I was tired, achy, and confused. I had never seen anything like that before and nothing like it since. It was the sort of thing that didn’t get retold often because we tellers grew tired of being accused of exaggeration. Listeners would tire or ask questions I could not answer. Questions like “why did it finally end? How did the fighting stop?” As years passed I began to wonder the same thing. I never knew, till that evening, years later. My cross-country co-worker told how this giant of a reff went from group to group, scuffle to scuffle, ordering people to stop, and they did. This player, new to the game, simply did what he was told; he stayed put. I doubt any one man has ever remained so cool amid such chaos, ever commanded such respect, or simply ever frightened so many people as Nev did that day. I smiled at my new friend, raised my Shirley Temple in a silent toast, and the two of us sat bored as the rest of our cohorts got drunk. 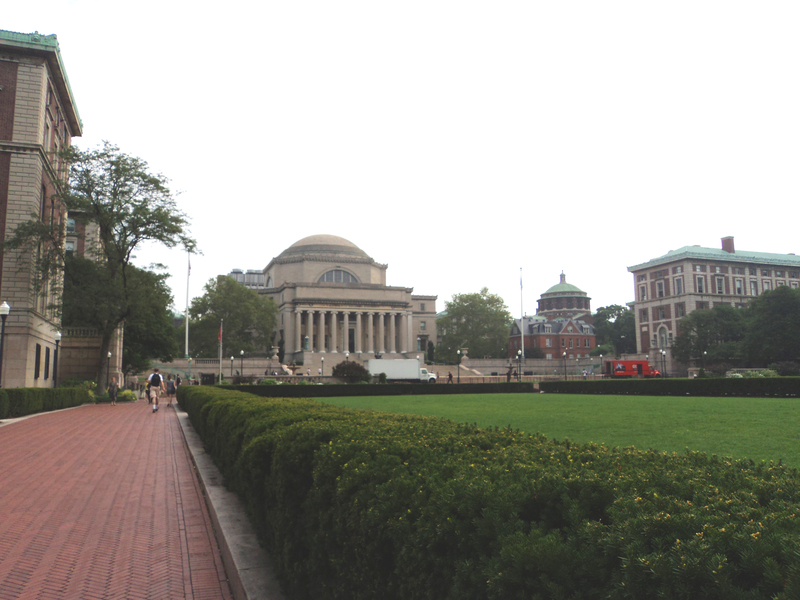 Columbia University was founded in 1754 in New York City. Since that time the school has produced 4 U.S. presidents, 15 Heads of foreign countries, 94 Nobel Prize winners, 101 Pulitzer Prize winners, and 1 undersized capitalist named Alexander Hamilton. 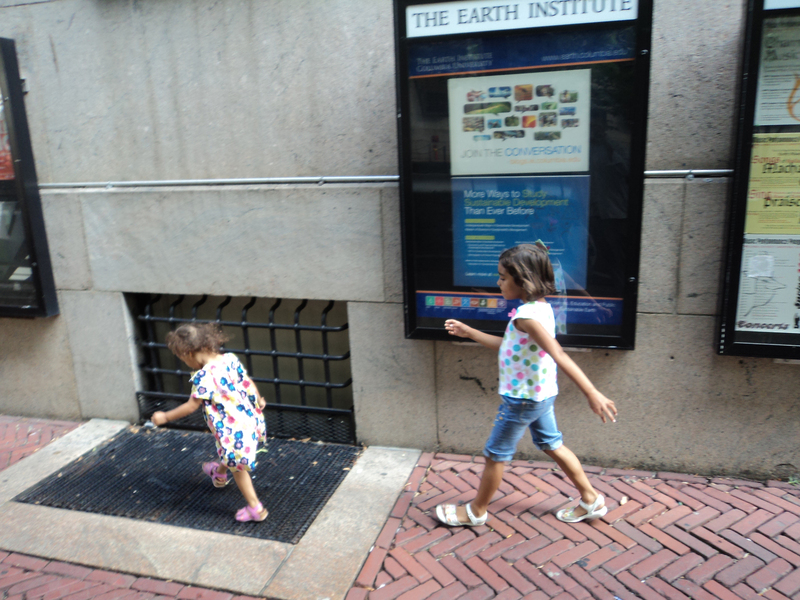 In the spirit of undersized overachievers, I brought my children along. Daughterhammas 2.0 and Daughterhammas 1.0 respectively. 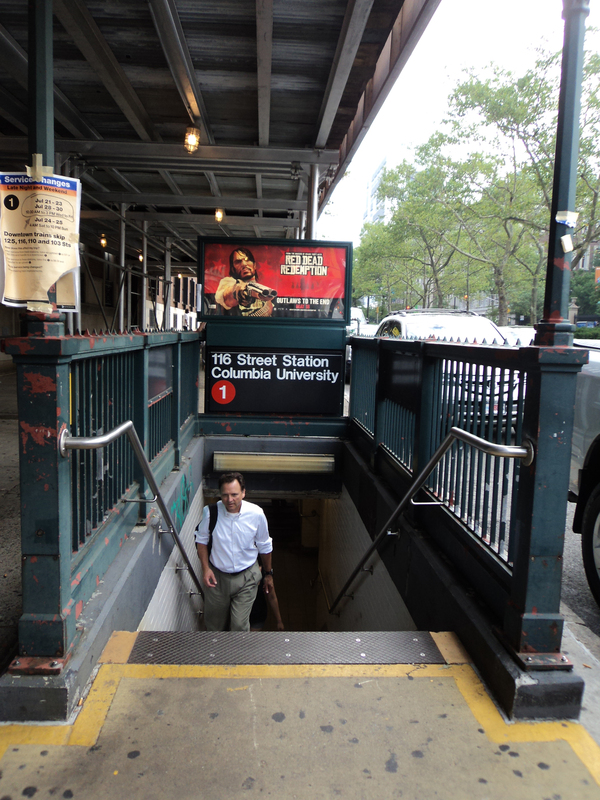 Unlike other Ivies, Columbia is deep in the heart of urban hustle and bustle. 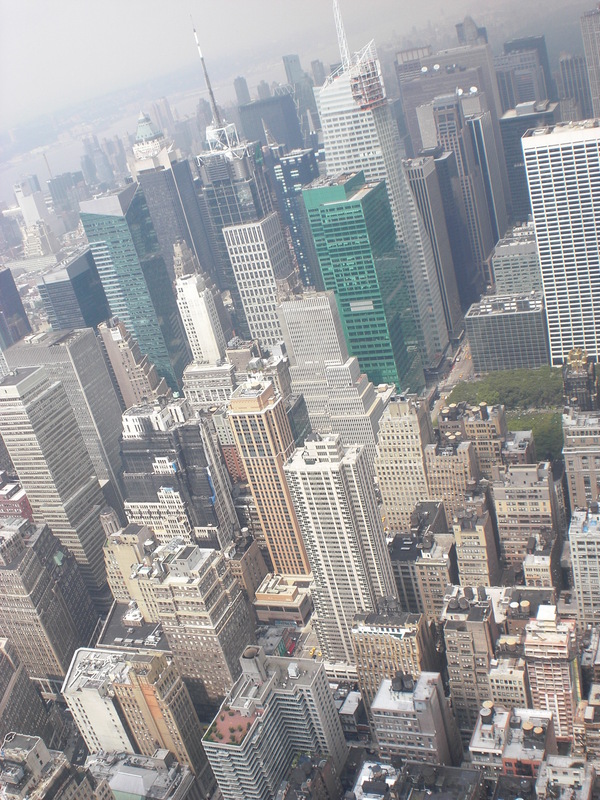 Its gilded towers of ivory are well overshadowed by towers of glass and steel. Because of this, it is easy to forget the schools pre Revolution past, or better yet, it is easy to forget the school all together. To help remedy this, the school was sure to have a stop on the red line named after it, along with the number they felt best describes the schools appropriate ranking. Take the red #1 to 116th. 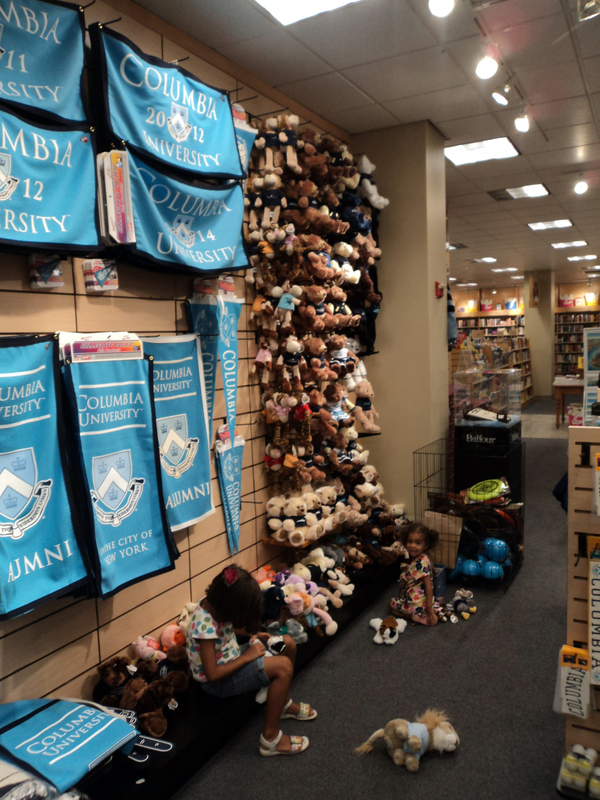 Nobels and Pulitzers are what any child should aspire to and fortunately the Columbia Bookstore is on board with early recruiting efforts. Banners and stuffed animals... start 'em young. Now lest one get the idea that this school is a mere blip on Gotham’s radar, it does possess all the architectural grandeur and flourishes of ironwork that all its peers posses. 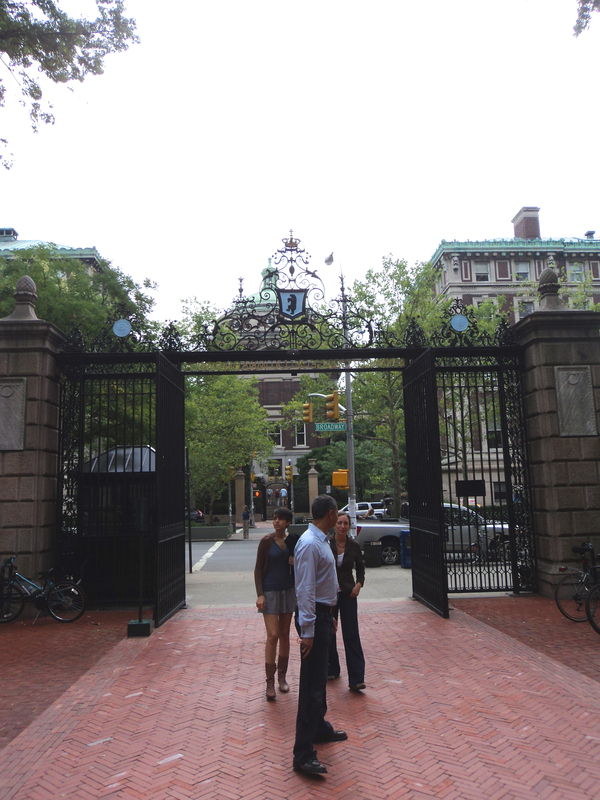 the Gates to Columbia's Barnard College. Good luck finding Waldo here. Now perhaps I jest too much. It’s in my nature, a native cheery temperment, but this school is in fact not a joke. I know it’s not a joke by the price of both the schools parking and its parking tickets. In the name of sustainability the institution is stamping out both cars and tourists. What it isn’t stamping out is what a true education should be. I know this not because I attended, but by this illustrative gem I found. 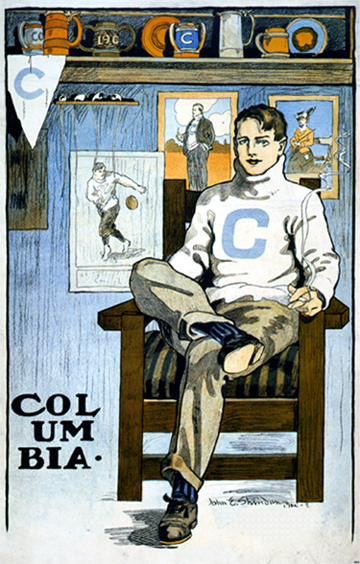 Not only is the Columbia man a natty dresser, but anyone associated with a true gentleman’s game would easily recognize the passing form of the athlete depicted directly to the right of the young man. My ode to the Big Green. On rare occasion one will find something or somewhere that completely lives up to its reputation or stereotype. Take for an example my first visit to a missionary Baptist church in the Bible belt. First of all a congregation of nothing but black people would have qualified as “new” to me at the time, as was the presence of a band, a man screaming from behind a pulpit, and women in large hats jumping around with their arms in the air. I remember sitting in that service thinking, “wow, they weren’t exaggerating!” It was just as I had been told. 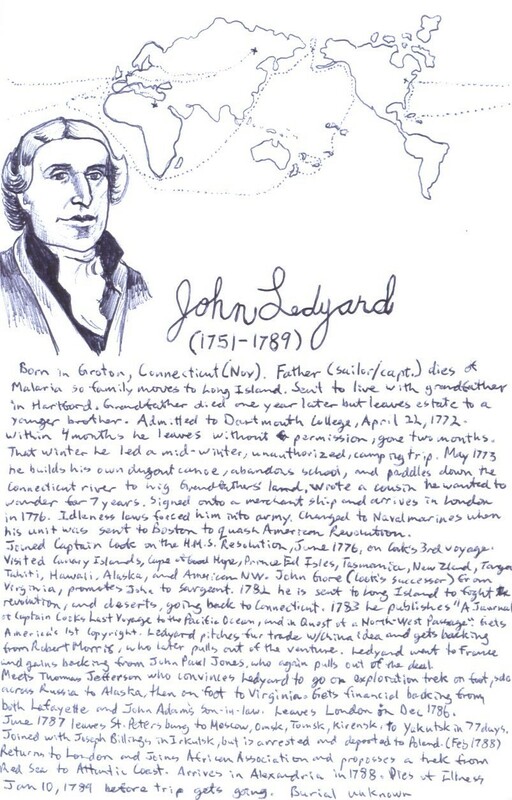 Dartmouth is epitomized by the story of John Ledyard. Ledyard was admitted to Dartmouth in 1772 at the age of 21. He then promptly disappears for two months. Upon his return he led a band of students on a mid-winter camping trip, without the school’s permission. Finally, in 1773, he builds his own dugout canoe and leaves school by paddling said vessel down the Connecticut River to his grandfather’s land near Hartford. 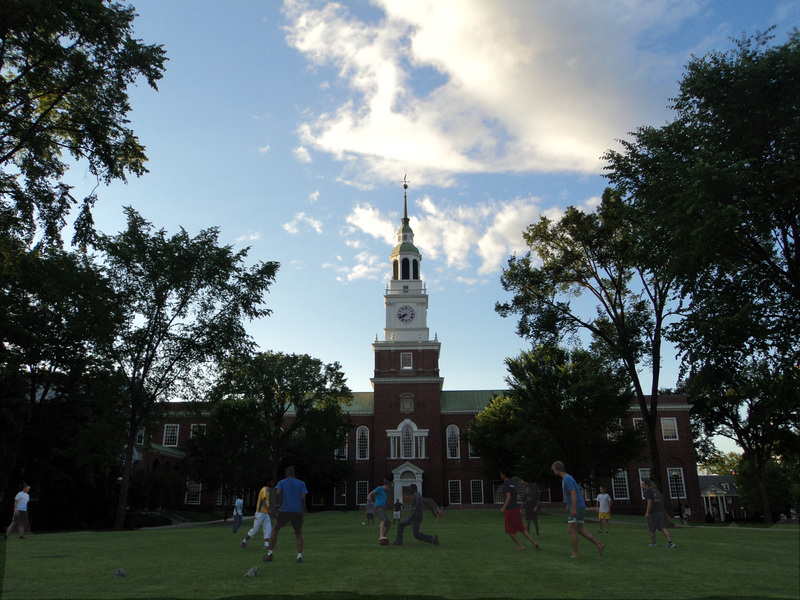 Today Ledyard is memorialized on campus by the Dartmouth Outing Club, the school’s largest student club. 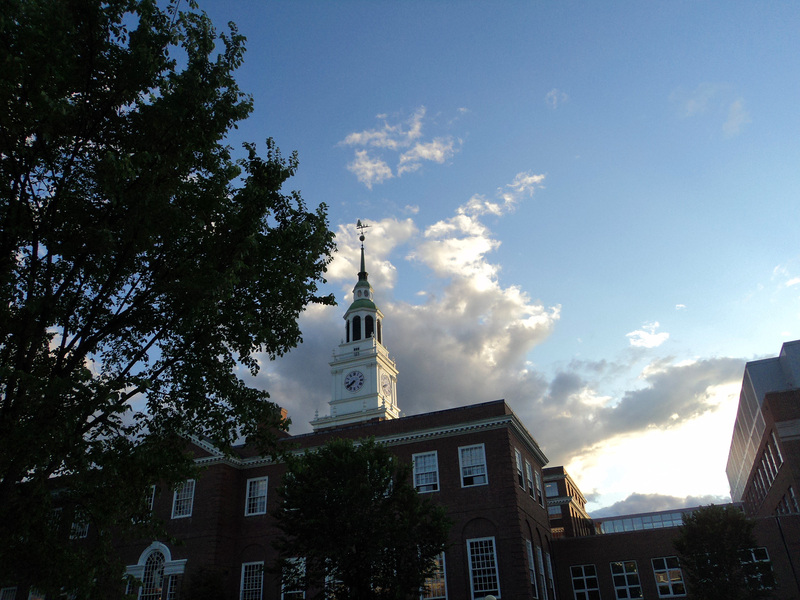 My GPS would not recognize “Dartmouth” as a destination so I blindly entered Hanover, thinking some signs would lead me to campus once I got to town. Upon arrival I found that Hanover pretty much is the campus, no signs needed. A large grass lawn sprawled out before a colonial style building capped with a clock tower. On that grass were a bunch of 20 something’s engaged in all sorts of outdoor activities. There was a barefoot soccer game going on in front of the building’s front steps, two girls who looked to be of foreign extraction tossing a football to each other, and at least two other groups tossing around a Frisbee. Over on one side was a student union with youth lounging about at tables drinking coffee and eating from plastic take out dishes. One of them was strumming a guitar and everyone looked at ease. The pastel and linens I saw at Yale were replaced by khaki shorts, sockless boat shoes, and forest green. Lots of forest green, be it on a hooded sweatshirt, a T-shirt, or a windbreaker, these students had no reservations advertising where they were attending. The oldest and largest collegiate outdoors club. 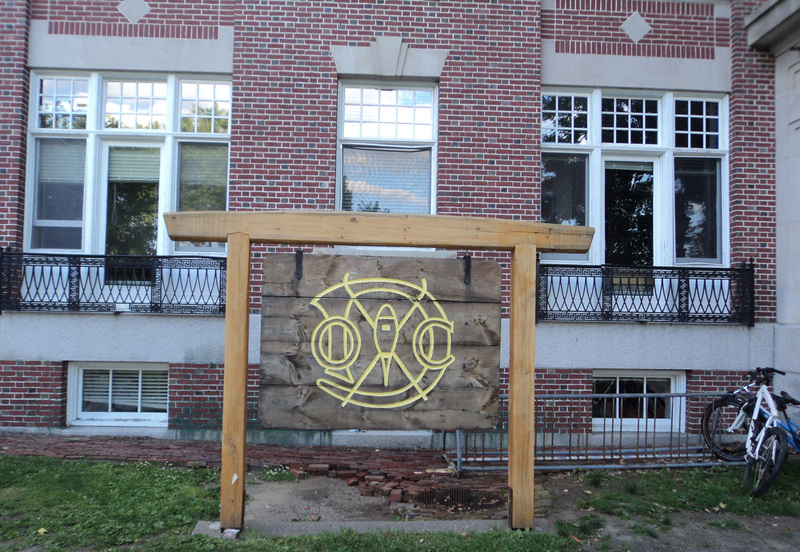 Next to this student union stands a large ornamented brick building with a wooden sign out front marking it as the home of the Dartmouth Outing Club. This marker had all the signs of 1930’s National Forest project; made from planks of wood fashioned into a panel, with the club’s logo carved out with the carved grooves painted yellow. This panel was then hung from a wood frame by two hinges on top, letting the sign swing like a gong. I found it amusing and kitsch when compared with the building it stood before. The building housing student clubs is filled with glass trophy cases housing silver plates and goblets inscribed with this award or that. The wood rails are finely sculpted and the lounge sofas are leather. Ski, debate, and other activities that insinuate these are not country folk getting educated but rather children of substance who enjoy their privilege out of doors. I also attended an “outdoorsy” school, even having a roommate who spent his weekends wearing hip waders, zapping stream trout with a cattle prod in order to number and tag them for a research project. I belonged to the “mountain club” in a half hearted attempt to be involved but the club was a bit pointless as all at the school engaged in the club’s outdoor activities whether members or not. There was no cache’ for putting a label on something we all did anyway. But we wore fleece jackets and Hi-Tech boots while at Dartmouth I saw embroidered anoraks and the aforementioned boat shoes. Dartmouth was truly Ivy and truly outdoors. 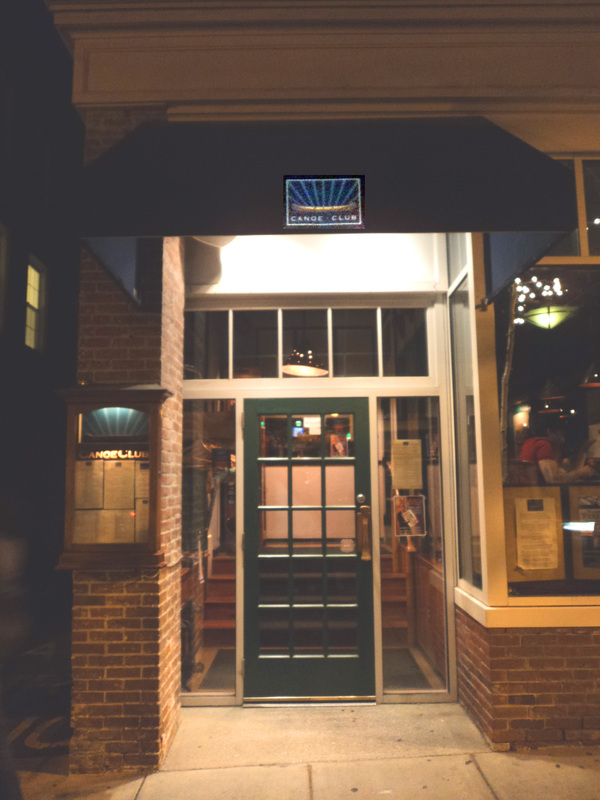 I walked down Hanover’s main street, past the bookstore, and into the Canoe Club, the Outing Club’s official social club that opens itself to the public when meetings are not in session. The restaurant’s walls are covered with vintage ski posters and pendants. A canoe hangs from the ceiling but the tablecloths are in fact, cloth. I sat in a booth facing a young man who was eating with what looked to be his parents. He wore a sport coat, as did his father, along with the obligatory khaki shorts and this time, sockless loafers. Son had disheveled mid length hair while father’s was neatly trimmed and gelled with streaks of grey. Mom had long hair pulled tightly back exposing large, gold, dangly, earrings. She had on a summer dress that looked both casual and expensive. Looking at them interact, they gave off the appearance of an interview in session, rather than a reunion, yet all looked pleased. The youth must have been giving acceptable answers. The food was fantastic. Those who find themselves on the outside looking in are rarely without opinion on what they see. As such I have often wondered about the home life, background, and future of these little sprigs of ivy, but never has it turned to envy. Except for what I saw next. Down the road from the main campus begins a series of sporting facilities; football, baseball, tennis, and the sort. 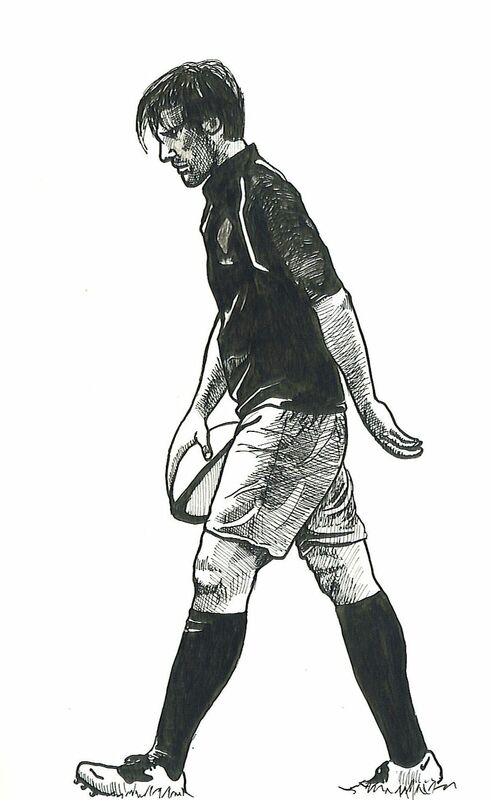 Keep going a bit further, on the outskirts, and you find what I say is their crown jewel; the rugby pitch. My “outdoorsy” school introduced me to this gentleman’s game and I represented them in my blue and white hooped jersey. Our coach was a friendly Tongan man who’s instructional method consisted of throwing you in a game and visiting you in the hospital afterward, to tell you when the next practice would be. He drew no pay, we had no budget, but we did have a field that was officially our own. Despite this fact we were required to shew the ultimate Frisbee crew from the grass each time we wished to use it. We had no clubhouse or locker room, but coach did teach us all the finer art of changing wardrobe mid field employing the instant privacy of a lava-lava. a facility befitting the game. 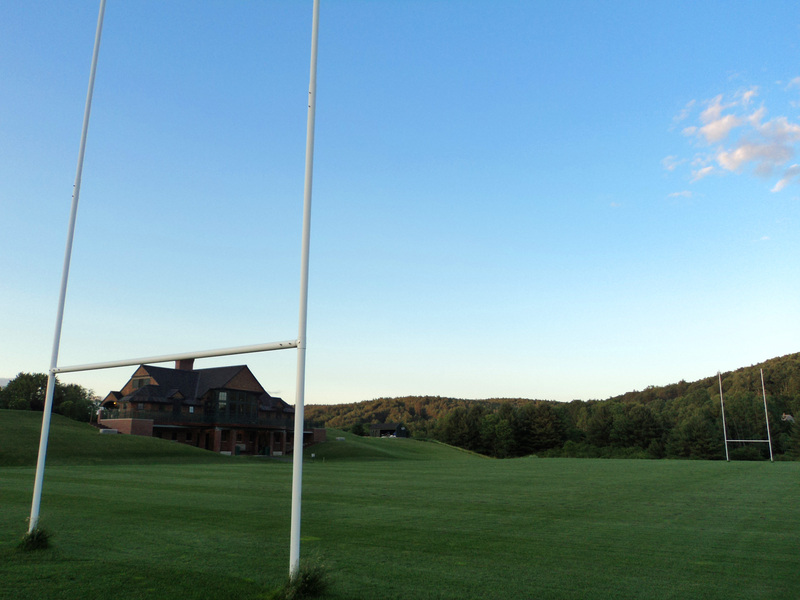 I first saw the Dartmouth rugby facility at sunset and felt a stirring within, akin to the one I feel at the end of the movie “Rudy”. The grass was perfectly mowed, perfectly level, and surrounded by hills and trees. One side is banked creating grassy bleachers and placed perfectly aside midfield, is the club house. 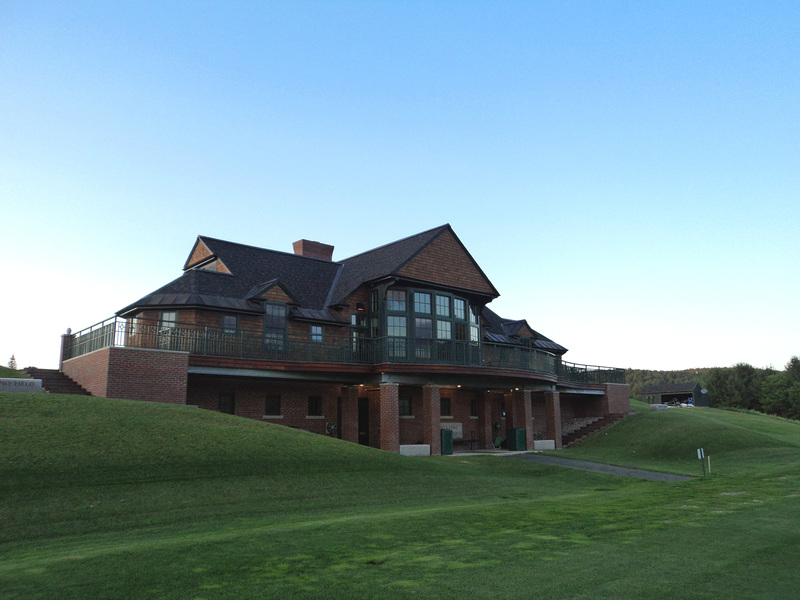 This building houses locker rooms and showers for both the home team and the opposition, an observation deck from which to view the matches, and a bar within from which victories can be celebrated in style. The team was away competing in the inaugural USA 7’s tournament (which was won by the school whose name is on my degree, but not the one for which I played), so I was reduced to playing peeping Tom as I circled the building looking through windows. How symbolic. a peeping Tom's look at the interior. They are coached by a former All-American who once played for the national team. Peering through the glass I could see the remnants of a “chalk-talk” with a white board up front and all the leather armchairs pulled into a semi-circle around it. 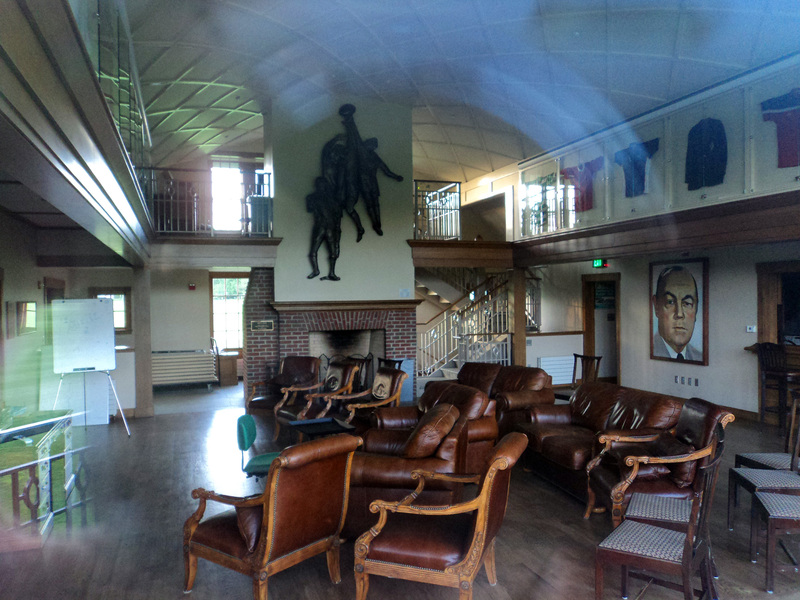 The room had a fireplace with a relief sculpture above it, an oil portrait on the wall, and a sign reading, “no rugby cleats up stairs”. Looking through that window from the outside, forming my opinions and judgments, I sighed. If one has privilege or opportunity, here is an example of the proper way to enjoy it. So bravo to a school who celebrates a man who dropped out to adventure through the forest and bravo to the school that treats rugby in a manner befitting those who play it. It’s my favorite of all the rugby jerseys I own. It lives in my gym bag, which lives in my van. The bag lives in my van for the same reason I have a pair of cleats wedged into the frame of the back door of the same vehicle. “Uh, why are there shoes stuck in your door?” a friend once asked. I thought the answer, “because I play rugby,” was sufficient but he was not satisfied. 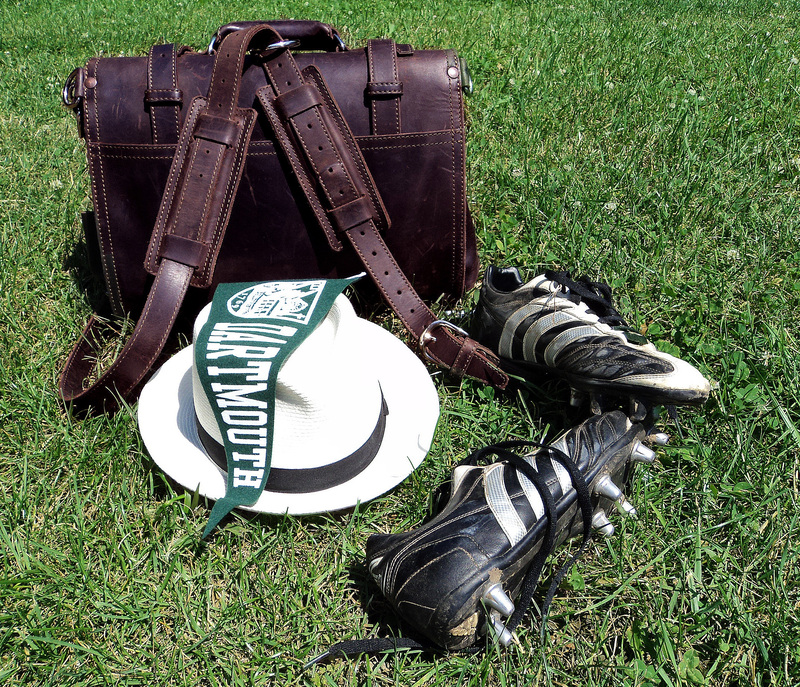 Any true rugger, especially an American one, is always prepared for a game. It is not some hopeful infatuation with the game, it is a responsibility. You see; I am a prop. Better yet, I play both loose and tighthead. I play that one position that if a team finds themselves without, the game is ruined for all. 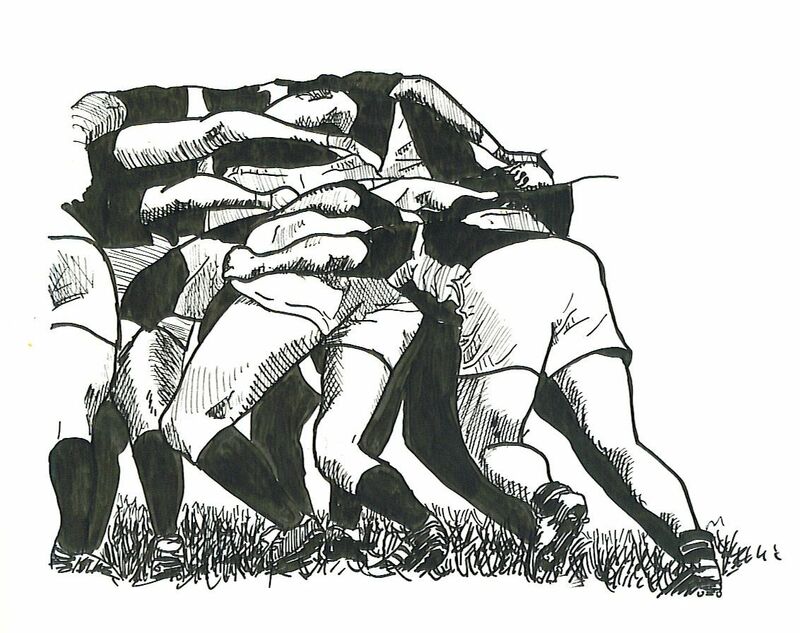 A rugby game with uncontested scrums is like a basketball game with four foot hoops… only worth playing if you are five years old. So I must always be prepared to play. This leads to why this is my favorite jersey. On one occasion when I only intended to watch, I was asked to play. The hosts of the Hogfest tournament were short on their B side. This B side was especially “B” in that their A side consisted mostly of players who had the experience of one season behind them. I had ten. B sides are usually a motley crew and this was no different. I fished into my bag for a blue jersey to make an attempt to match the rest of the guys who themselves struggled to piece together outfits that could be called uniform. I normally won’t wear the jersey of a team I haven’t played for in anything but a social setting and I was surprised to realize that since college I haven’t played for a team that wore blue. The royal blue of Samoa was not the navy that would have worked best, but it separated me from the Crimson of the other team and that was all that could be hoped for. We were playing the A squad from HBS. That’s HBS as in Harvard Business School. I have little recollection of how that game went. I’m sure we lost. 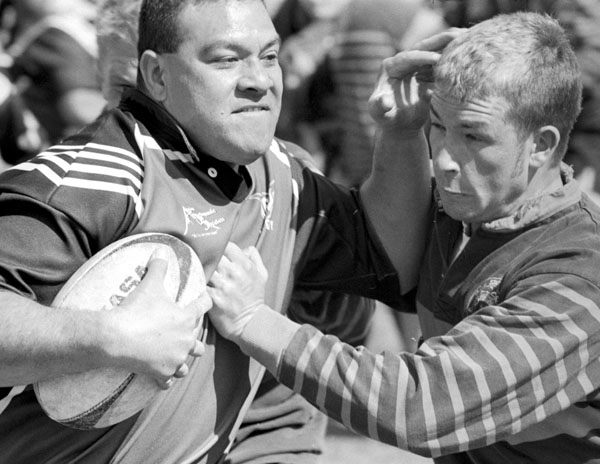 A major feature of rugby games with inexperienced players is a major mess conglomerated around the ruck. People dive over each other, shove for no reason, and the ball is usually killed. These are the games I find myself most useful because a killed ball results in a scrum. I’m sure we scrummed 500 times that day. At one such breakdown HBS had skillfully cleaned away our entire pack leaving one lone forward posted over the top of the ball, patiently waiting for his team to set up behind him. With all the other forwards in a pile making little attempt to untangle themselves, and this guy sitting there like he ruled the world, I cleaned him. I put my shoulder in his stomach, wrapped both arms around one of his legs, and drove him one meter into the air, two meters back, and about five meters into the ground. It was quite rewarding and completely legal. Play went on behind us, I popped up to my feet and offered my hand. He accepted my help but once on his feet exclaimed, “you f_ (insert homosexual slur here)”, and took a wild swing at me with his free hand. He was obviously no boxer and I easily ducked under his hook and stood right back up nose to nose with my attacker. I looked at the rage in his eyes and inexplicably started laughing. I jogged back to join the game in progress and could not wipe the smile off my face. The response from the guys was unexpected. No laughter, no relating acceptance, no support. My comment was met with blank stares. Well, not blank exactly, more like petrified. I think one guy faked a nervous chuckle. It took me a few moments to realize what had just happened. One of the drawbacks of being prepared to play whenever and with whomever, is you may not fully appreciate who you are playing with. It wasn’t till after the game that I fully realized that the one school that outranks HBS scholastically and is in fact ranked number one in business, was the one I was on. I learned that day that no matter how excited, no matter how good the story, never forget your audience. Thankfully those guys are an understanding bunch, or possibly just undersized, as they have repeatedly invited me back. I am convinced they are the best bunch of privileged rich kids I have ever met and I no longer have the desire to knock anyone out for the previously stated reason. That being said, and thanks to these guys, I don’t trust that I will pass up the opportunity again if it ever presents itself. I now have a jersey in the appropriate colors, and the pictured one has gone back in the bag.